LASIK permanently thins and weakens the cornea, which may lead to progressive steepening or bulging (ectasia) of the cornea with associated deterioration of vision. “Post-LASIK corneal ectasia is one of the most troublesome complications after LASIK,” Dr. Seitz said. “Its incidence has been reported to be between 0.04% and 0.6%. It can occur several months or even years after laser surgery." Source: Stefanie Petrou Binder, MD. 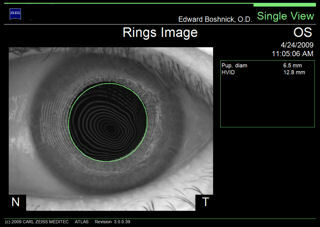 Intracorneal ring segments and ectasia. EyeWorld. January 2019. Pg.38-39. Read a sample of other types of LASIK injury reports currently on file with the FDA. The FDA has full knowledge of the growing epidemic of post-LASIK ectasia, but they are complicit in failing to warn prospective LASIK patients. The agency is far more concerned with protecting the financial interests of laser companies and shielding eye surgeons from malpractice lawsuits than in protecting public health. In an apparent attempt to hide the truth about post-LASIK ectasia, LASIK surgeons may deliberately misdiagnose post-LASIK corneal ectasia as post-LASIK keratoconus. Keratoconus is a naturally occuring disorder of the cornea which usually affects both eyes and typically begins during puberty or late teen years. If a patient did not have keratoconus, forme fruste keratoconus, strong family history of keratoconus, or early signs of keratoconus before LASIK and experienced steepening or protrusion of the cornea with vision loss after LASIK, then the correct diagnosis is likely ectasia. 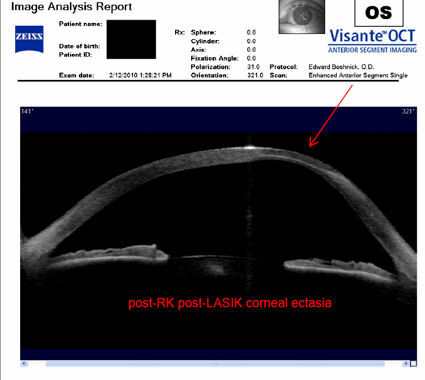 Is post-LASIK ectasia (keratectasia) real, or is it actually genetic keratoconus hastened by LASIK, as some LASIK surgeons would have you believe? Read this scientific study, which found that post-LASIK ectasia and keratoconus are not the same histopathologic processes. 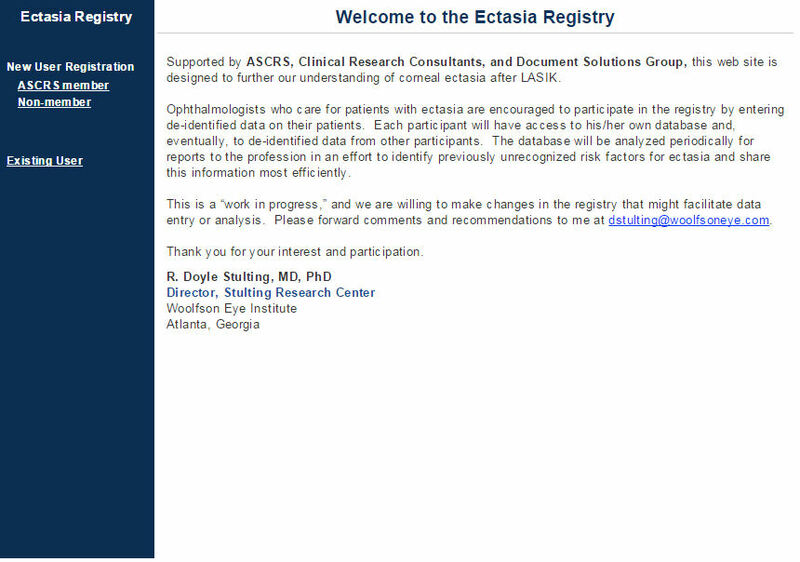 Proof that Lasik surgeons are aware of the legal requirement to report post-Lasik ectasia to the FDA, but don't: Listen to presentation given during a private meeting of LASIK surgeons, in which the speaker admits that ectasia cases are not being reported (as required by federal law), and that the rate of post-LASIK ectasia is likely "a lot higher" than 1%. Says speaker, "... I think the keratectasia incidence is a lot higher, just like you alluded to, but it's not being reported because of the litigious nature of what's going on. A lot of us obviously don't report it because these are patients being referred in to us." Persons experiencing post-LASIK ectasia should seek the advice of a physician. If you would like to share your story with us, email lasikcomplications(at)yahoo(dot)com or use the contact form located on the menu bar above. What is corneal ectasia? Rate of occurrence? Risk factors? Treatment? What causes post-LASIK corneal ectasia? Images courtesy of Dr. Edward Boshnick, who has devoted his practice to the restoration of quality vision and information on post-LASIK ectasia. Spice Girl, Mel B, blind in one eye from ectasia after laser eye surgery, facing corneal transplant. The image below on the left is a photo of a patient who had LASIK in 1997. He developed corneal ectasia (bulging) and started losing his vision several years later. The image below on the right shows the protrusion of a cornea which developed post-LASIK ectasia. The abnormal corneal curvature results in severe visual distortion which is not correctable with glasses or soft contact lenses. The image below on the left shows a cornea with post-LASIK ectasia treated with INTACS. The patient had LASIK in 2000 and developed ectasia 2 years later. INTACS were inserted in 2006 in an unsuccessful attempt to smooth out the corneal surface. In 2007 white blood cells and protein materials began adhering to the medial aspect of the plastic inserts. The INTACS are at the anterior corneal surface causing the patient discomfort and increased visual aberrations. Corneal ectasia can occur after Radial Keratotomy (RK) as well as after LASIK. The image below on the right shows the cornea of a patient with post-RK ectasia. The patient had RK in 1988. He began losing visual quality in 1990. In addition to the corneal protrusion, note the faint white spot at the apex of the curve. This is internal corneal tissue that is protruding out of one of the RK incisions. The photo below on the left is a cornea 8 years after LASIK. The patient developed ectasia. 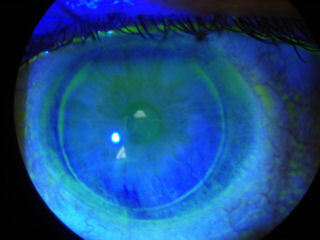 In the photo, you can see that the dye instilled in the eye is staining at the flap-cornea interface -- a clear sign that the LASIK flap-wound is not healed. The photo below-right shows the eye of a patient who had botched RK surgery followed by a corneal transplant. The transplanted cornea developed ectasia. The patient in the photo below-left has keratoconus, not post-LASIK ectasia. The patient was implanted with one INTACS, which failed to restore functional vision. The INTACS created a new set of problems, and the patient decided to have it removed. Currently the patient is attempting to wear lenses again, but as you can see, the lens is riding off center. You can also see a suture at the 11:00 position that remains after removal of the INTACS. Also note 3 white scars perpendicular to the suture. Click on image for a larger view. The patient in the photo below-right underwent LASIK in 2000. The dark round area at 2:00 o'clock is the area of the cornea with ectasia. The area is dark due to the elevated irregular surface. For unknown reasons the tear film cannot adhere to the corneal surface where it is bulging, hence, it is much darker than the surrounding corneal tissue. The LASIK flap margin is also clearly visible. The patient below had LASIK in 2003 and now has post-LASIK ectasia. Note blood vessels growing from the white of the eye into the superior region of the cornea. This is known as corneal neovascularizaton. A normal cornea is transparent, containing no blood vessels. Corneal neovascularization is a disease state, which is a direct result of trauma to the cornea. This patient's vision will be impaired if the blood vessels reach the visual field. Iatrogenic keratectasia / ectasia is one of the most feared and dreaded complications of LASIK. The rate of ectasia after LASIK is estimated to be about one in 2,000, but this number could be an underestimate due to underreporting and lack of long-term followup after LASIK. There are likely several thousand patients suffering from post-LASIK ectasia in the United States. The medical literature contains reports of late onset ectasia occuring several years after LASIK. Quote: "The actual incidence of ectasia is undetermined, an incidence rate of 0.04 to almost 2.8% has been reported." Source: Kohlhaas M. Iatrogenic Keratectasia: A Review. Klin Monbl Augenheilkd. 2015 Apr 8. What is corneal ectasia? There is pressure inside the eye called intraocular pressure (IOP), which pushes on the back surface of the cornea. A normal healthy cornea easily withstands this force. But after LASIK, the thinner, weaker cornea may begin to give way to this pressure, leading to steepening or bulging of the front surface of the cornea with associated increase in myopia and irregular astigmatism. Reported risk factors for ectasia after LASIK include abnormal corneal topography, pre-existing keratoconus, forme fruste keratoconus, or pellucid marginal degeneration (PMD), insufficient stromal bed thickness, high myopia, and age younger than 25 years. Operating on patients with pre-op thin corneas should be avoided. There is no cure for ectasia. Reported treatments for the management of post-LASIK ectasia include hard contact lenses; intraocular pressure-lowering drugs; and intracorneal ring segments (ICRS), or INTACS. A corneal transplant may be required. Corneal collagen cross-linking (also known as CCL, CXL or C3R), is a relatively new treatment for ectasia using riboflavin and UVA light. Corneal collagen crosslinking received FDA-approval in 2016. Learn more about clinical trials for treating corneal ectasia with corneal collagen cross-linking at ClinicalTrials.gov. This is for informational purposes only. The webmaster of this site does not endorse these treatments. A 2015 survey of Lasik surgeons found that 46% of surgeons surveyed had one or more documented cases of post-Lasik ectasia in his or her surgical patients. 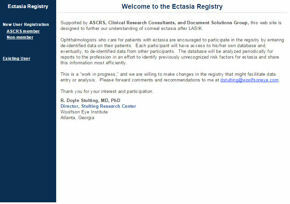 Fortunately, we took a screen shot of the homepage of the ectasia registry site before it was taken down. 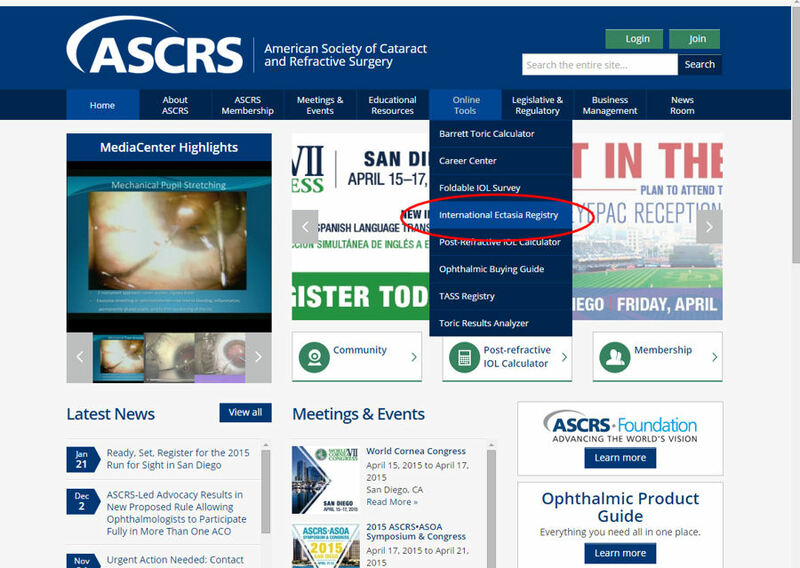 We also have a screen shot of a link to the ectasia registry from the American Society of Cataract & Refractive Surgery (ASCRS) website before it was removed. ASCRS is a 9,000 member-strong organization of Lasik and cataract surgeons. It appears that the ectasia cover-up is an industry-wide effort led by leading Lasik surgeons. Click images to enlarge. The following images were acquired using a technique called optical coherence tomography, or OCT. The instrument produces a cross-sectional image by scanning the front of the eye (anterior segment) with a beam of light. Think of it like an ultrasound using light instead of sound waves to create an image of living tissues. 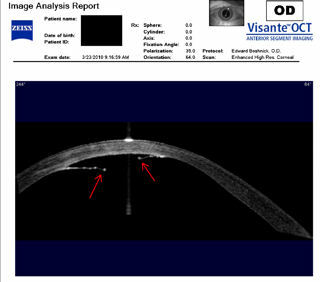 The image directly below is a scan of a healthy, unoperated cornea for comparison with the following images of post-LASIK ectatic corneas. 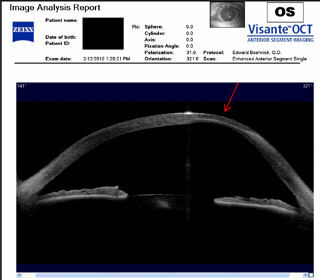 The scan below shows a post-LASIK cornea with ectasia. The cornea is only 250 microns thick at the thinnest point, which is half the thickness of normal cornea. The patient is wearing a large therapeutic contact lens. The white curved line at the top is the front surface of the lens. Below that is the fainter white curved line representing the back surface of the lens. 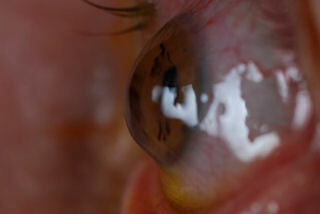 Between the lens and the cornea is the space filled with saline solution, which has a grainy appearance. Click on image to enlarge. 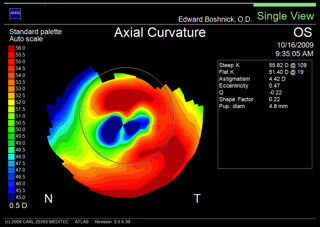 The image below is the cross-sectional scan of a post-LASIK cornea. The white curved line at the top is the front surface of a hard contact lens. The next faint white line is the back surface of the lens. The next area which has a grainy appearance is the space between the lens and the cornea, which is filled with saline solution. The cornea shows the classic signs of ectasia -- thinning, bulging, and irregularly shaped. 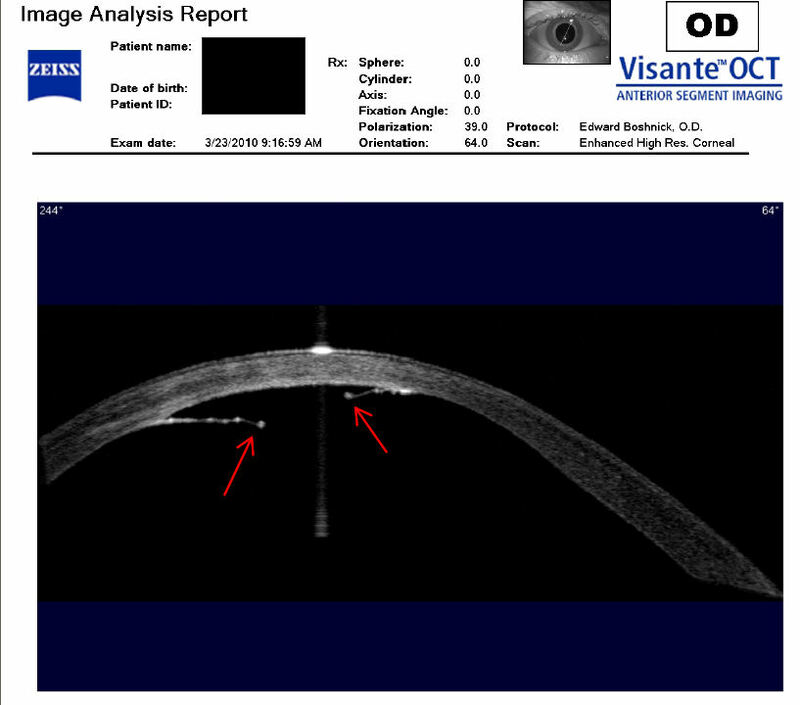 Below is a cross sectional scan of the cornea of a patient who had RK followed later by LASIK. 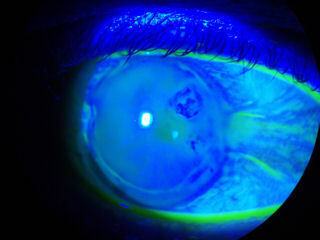 The patient developed corneal ectasia. The red arrow points to the protrusion (ectasia). 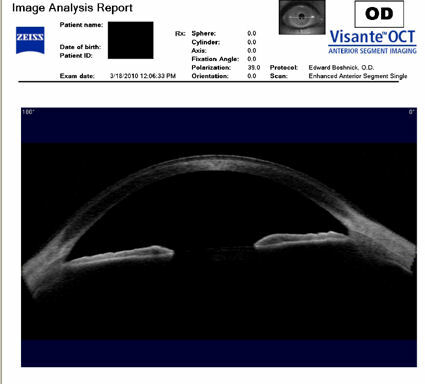 The scan below shows the cornea of a patient who developed ectasia after LASIK. 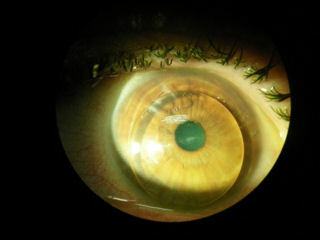 The patient is wearing a rigid scleral contact lens. You can see the protrusion of the cornea at the weakest spot (ectasia), which results in very distorted vision. Glasses and soft contact lenses are ineffective on an eye such as this. Click image to enlarge. 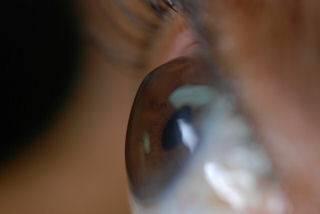 The cornea shown below had RK followed by LASIK and developed corneal ectasia. Click on the image for a larger view. 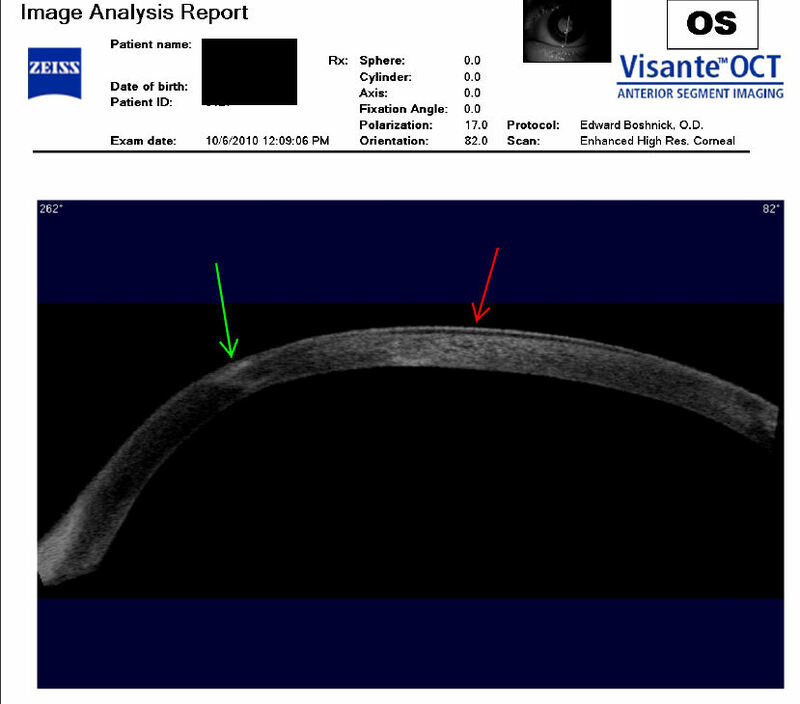 The next two scans below show a rigid scleral contact lens on a post-LASIK ectatic cornea. The cross-sectional scan below shows a cornea with post-RK, post-LASIK ectasia. The flap is separating from the underlying tissue. The green arrow points to the location of an RK scar and ectasia, and the red arrow points to the location of the flap separation. 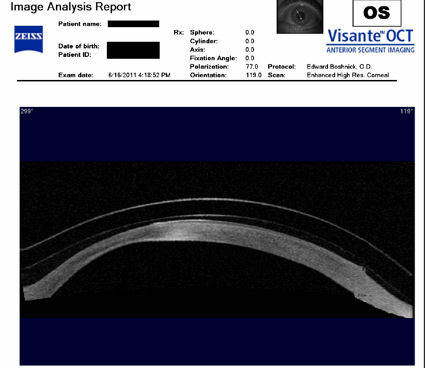 The patient below developed post-LASIK corneal ectasia, and was treated with INTACS. The opposing red arrows point to the anterior and posterior surface of scleral lens that the patient is wearing. The green arrow points to the fluid-filled space between the lens and the cornea. The white arrow points to the posterior surface of the LASIK flap, which never heals. The blue arrows point to the two INTACS, which are implanted in the cornea. The fact that the patient is now wearing scleral lenses indicates that INTACS implantation failed to restore functional vision. Click image to enlarge. 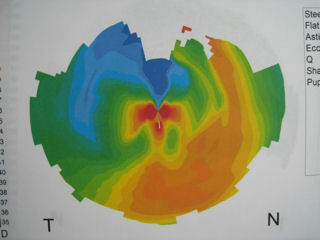 The first three images below are corneal topographies of eyes that developed ectasia after LASIK. The large range of colors represent significant changes in corneal steepness and refractive power across the central diameter of the cornea. Red represents the steepest areas of the cornea where the cornea is protruding. Deep blue represents the flattest areas. These topographies demonstrate corneas with very irregular surfaces full of hills and valleys and not smooth or spherical. 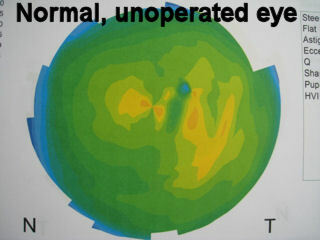 Corneal surface irregularity produces a distorted image on the retina. 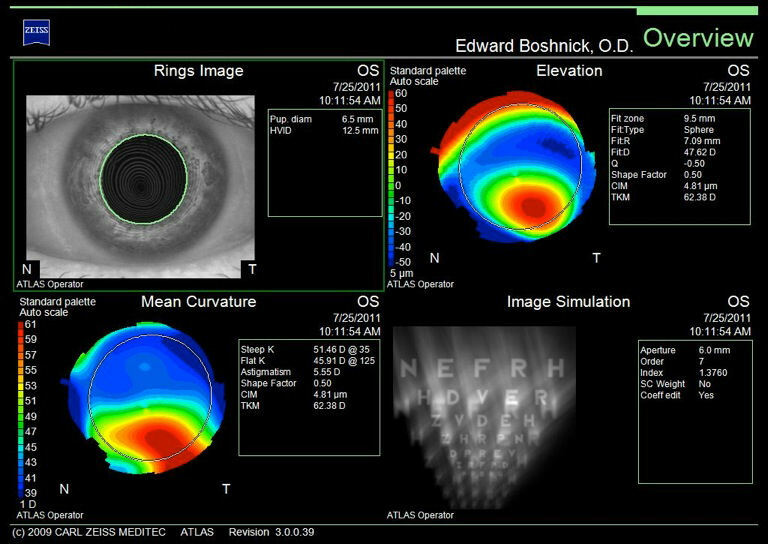 Compare these topographies of post-LASIK ectasia to the topography of a normal, unoperated eye (bottom-right). 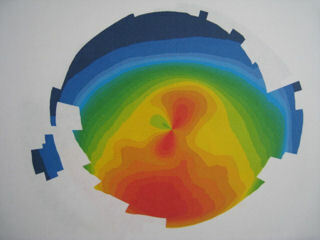 The topography below-left of a post-LASIK eye with ectasia shows extreme power changes within the patient's visual field (central cornea), which leads to severe visual distortions. The deep red area at the 4:00 position is the location of the ectasia (bulging). The topography below-right shows the steepest area of the cornea (ectasia) at the 11:00 - 12:00 position. 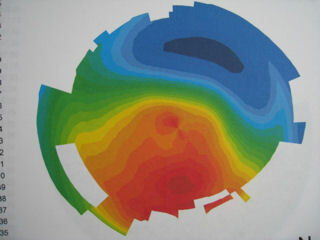 The image below contains different "maps" of the left eye of a patient with post-LASIK ectasia. The image labeled "Rings Image" is a reflection of light from the surface of the eye. In a normal eye, the rings would be concentric circles. If you click on the image to enlarge you will see that the rings are irregularly shaped, which indicates visual distortions. The red area on the "Elevation" map and "Mean Curvature" map indicate protrusion of the cornea (ectasia). The "Image Simulation" shows how white letters on a black background would appear through this patient's left eye. 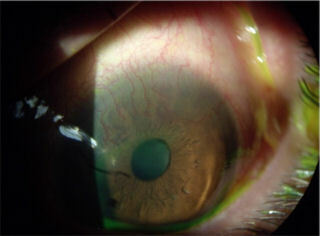 The photo below-left is a post-LASIK ectatic cornea with hydrops. Progressive bulging and thinning of the cornea associated with ectasia may rarely lead to rupture of the membrane on the back surface of the cornea in response to intraocular pressure, which is known as hydrops. In this case, the patient had LASIK in 2000. Two years later he developed ectasia. In August, 2009 he awoke to a red, cloudy cornea. 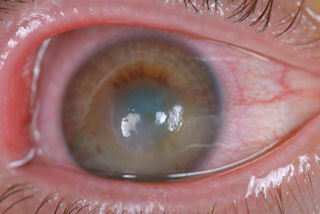 The back surface of the weakened cornea had ruptured (hydrops), and aqueous fluid from inside the eye entered the cornea, causing this red, cloudy condition. At the time this photo was taken, the patient had no functional vision and could only count fingers at a 12-inch distance. 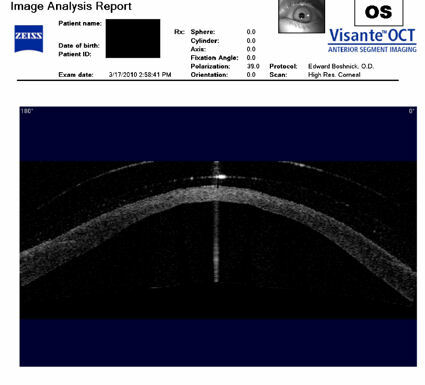 The image to the right of the photograph is a cross-sectional scan of the patient's cornea taken at a later date after the patient underwent a corrective procedure. The two red arrows point to the break on the back surface of the cornea. (The vertical beam of light is an artifact). Click on the scan to enlarge. The next two images are photos of an eye that developed ectasia following RK surgery and subsequent LASIK surgery. The image on the left shows the protrusion of the cornea. The image on the right shows the patient wearing a scleral contact lens. 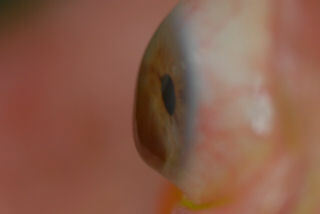 The hazy spot at the bottom of the pupil is a scar caused by a laser procedure, which was performed in an unsuccessful attempt to correct the problems caused by the previous surgeries. We call this the "domino effect of unnecessary eye surgery". The next three images are the left eye (OS) of a surgeon from Venezuela who had LASIK about 4 years ago and later developed ectasia. He was unable to perform surgery until he was fitted with a special scleral lens. The first two images were acquired with a corneal topographer. 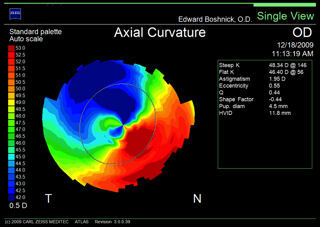 In the image labeled "Axial Curvature", the extreme range of colors represent severe irregular astigmatism and significant corneal power changes across the central cornea, which results in severe visual distortions. The image labeled "Rings Image" is a reflection of light from the surface of the eye. In a normal eye, the rings would be perfectly round concentric circles. Click on the image to enlarge and you will see that the rings are irregular and distorted, which indicates that the patient's vision is distorted. The third image, which was taken 10 months later, is a cross-sectional scan of the cornea. The red arrow points to the ectatic area of the cornea. "Keratectasia is an insidious complication of laser in situ keratomileusis (LASIK), occurring months after an apparently uncomplicated procedure." Chen et al. Clin Experiment Ophthalmol. 2007 Jan-Feb.
"In my experience, the odds that an eye with a corneal thickness of 500μm will develop ectasia postoperatively are a lot higher than 5%. I would estimate a risk of between 50% and 75%." Lee T. Nordan, MD. Cataract & Refractive Surgery Today, October 2006. "Unfortunately, because of long term complications of LASIK, such as keratectasia, this procedure is used more cautiously." Karimian et al. J Refract Surg. 2007 Mar;23(3):312-5. 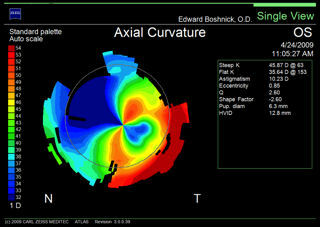 "At 6 months postoperatively, the LASIK eyes experienced a 48% reduction in corneal biomechanics..." Jorge Cazal, MD. OSN SuperSite 19Feb2008. "Performing a refractive procedure on a cornea that is too thin may result in blinding complications." Source: FDA website - When is LASIK not for me? "When I woke up the next morning I felt like it was the greatest thing I'd ever done in my life -- never have to wear glasses again. This is a good thing... Over the years the surgery apparently is falling apart, declining..."
Editor's note: Todd Krouner is a medical malpractice attorney experienced in representing patients with post-LASIK ectasia. This is for informational purposes, and is not an endorsement. The FDA, laser manufacturers, and refractive surgeons are aware of limits on flap thickness, ablation depth, and diameter of the optical zone imposed by corneal biomechanics. When the FDA initially approved lasers for LASIK, it established a minimum of 250 microns of corneal tissue under the flap after LASIK surgery to prevent corneal instability and progressive forward bulging. Subsequent reports in medical literature indicate that 250 microns is not sufficient to ensure corneal biomechanical stability. In response, some surgeons stopped performing LASIK or raised the residual stromal thickness limit in their practices. However, the majority of surgeons continue to observe the 250 micron rule initially established by the FDA, even though this limit has been shown to be insufficient. The 250 micron rule is often violated inadvertently during surgery, as microkeratomes that cut the LASIK flap are unpredictable and produce flaps of varying thickness. For this reason, flap thickness should be measured intraoperatively. Most surgeons have not incorporated this important measurement into the surgical procedure prior to ablation, which places patients with thicker flaps at increased risk. Stephen Slade, MD: "The debate about the appropriate thickness of a LASIK flap has much to do with our growing fear about causing postoperative ectasia. We are all aware that there is a limit to how much corneal tissue can be removed without the risk of producing a negative postoperative response. Concerns about ectasia have motivated many of us to perform PRK or Epi-LASIK." Corneal thickness before LASIK varies between individuals, with an average of approximately 540 microns. The LASIK flap is generally intended for 160 - 180 microns in thickness, which is about thirty percent of the original thickness of the cornea. It is known that actual flap thickness varies from intended thickness. 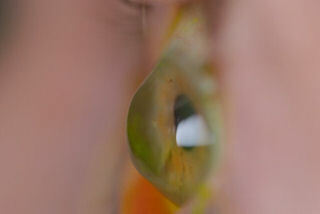 After the flap is cut and reflected back, the laser ablates corneal tissue to change the refraction of the eye. The amount of tissue ablated per diopter of refractive error varies between lasers. For the purpose of this discussion, let's assume the laser ablates 15 microns per diopter. A patient with myopia of -6 D will have 90 microns of tissue ablated. If the patient had an original corneal thickenss of 540 microns and the surgeon achieved a 160-micron flap, the patient would have 290 microns of corneal tissue remaining under the flap. When the FDA approved LASIK, it established a minimum of 250 microns of residual stromal thickness (RST) under the flap after surgery. This guideline was just an estimate. No medical study had established that 250 microns was sufficient to prevent the cornea from bulging forward in response to the pressure inside the eye. In the years since LASIK was approved, numerous studies have examined corneal stability after LASIK. 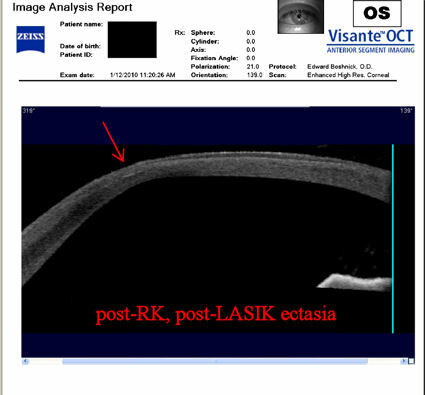 There are now many case reports of patients developing ectasia weeks, months or years after LASIK, even in cases of more than 250 microns of RST. In response to the rising number of cases of ectasia after LASIK, some surgeons raised their minimum RST and others abandoned LASIK altogether. There is no cure for post-LASIK ectasia. 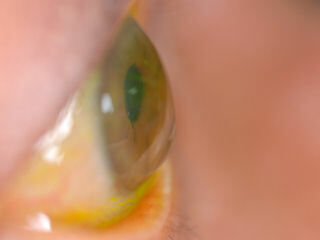 If ectasia progresses, a corneal transplant may be necessary. Nurse with post-LASIK ectasia calls outcome "horrible"
I had lasik surgery in 1998 and following, have post lasik ectasia in both eyes. My vision has progressed to the point where my left eye is legally blind, and i function using my right eye, which gives me 20/60 vision but with severe astigmatism, so i have constant disabling headaches. I also wear an eye patch on my left eye because my brain cannot process the images produced by the eyes at the same time - anisometropia - without getting even more severe, intolerable headaches. Because of the constant headaches and low vision, i cannot work or attend school and i do not qualify for disability. The surgery - performed, using a visx laser - has absolutely ruined my life. I am not a good candidate for a cornea transplant because i have extremely dry eye, also exacerbated by lasik surgery. This surgery has destroyed my life. Please contact me if you want further info. I received lasik on both eyes in 2006 at the laser eye center. Dr [redacted] of the Eye Consultants performed the surgery. I experienced severe dryness after the surgery. I also experienced problem driving at night and watching TV. Some days were good and some were bad. When things started getting really bad, I went back to Dr. [redacted]. After some tests, he concluded that my vision distortion is caused by a condition in the cornea, something he termed as 'keratoconus'. He also mentioned that my eyes could be susceptible to eventually suffer this condition, but most likely the progression got elevated by the LASIK. He has signed me up to participate in a study called 'collagen cross-linking' of the cornea - at [redacted] Institute - where they use a combination of vitamin B2 and UV light to strengthen the corneal muscle. This study is my only hope. If this does not work out for me, then I would have to consider a corneal eye transplant according to Dr. [redacted]. I seriously regret having done LASIK. I am hoping that this complaint will help FDA to help future potential LASIK candidates to seriously consider all options before opting. "Nobody is a good candidate to have their corneal strength weakened by a third..."
Finally, in 2007, I was diagnosed with post-LASIK ectasia, as my corneal topographies showed the trademark sign of inferior steepening, which accounted for my increasing cylinder and increasing symptoms of double/multiple vision. 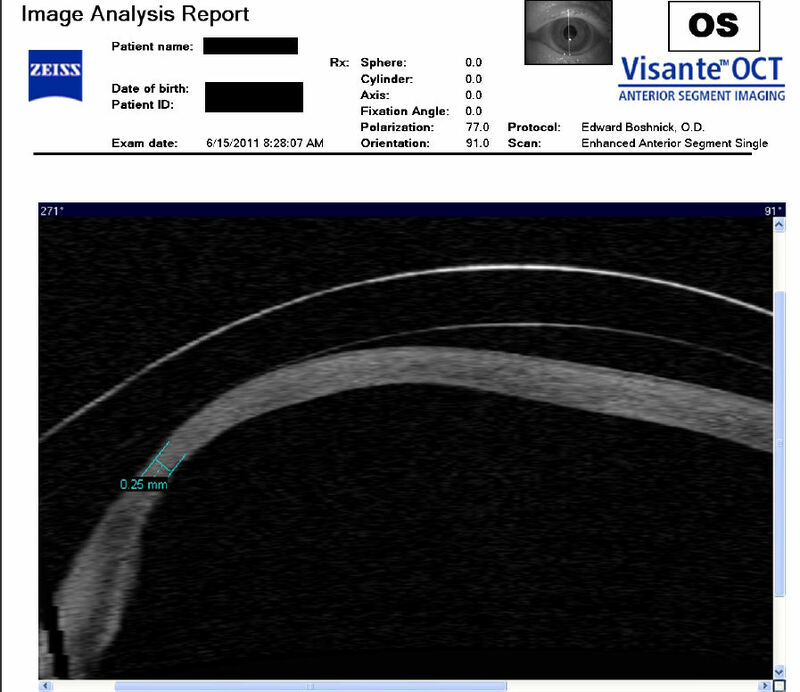 I have thick corneas, had stable refraction for 2 years, and measurements of flap thickness with an Artemis device showed no signs of a too-deep flap thickness. In other words, I was a 'perfect' candidate, whose preoperative topography -which showed ~0. 5 d of inferior steepening- would probably not be turned away today despite the new 'stricter' guidelines being suggested. The reality of course, is that nobody is a good candidate to have their corneal strength weakened by a third by a microkeratome, for no medically indicated purpose. However, this butchery remains approved by your agency. 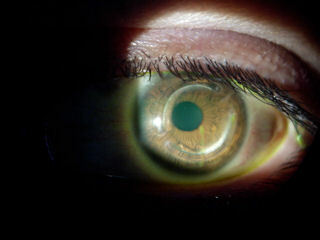 Firefighter develops ectasia years after LASIK, says "LASIK is destroying lives"
I received lasik in 2002 on both eyes. Things went well for three years... In 2007, i went to a local ophthalmologist seeking glasses and contacts to help with my vision. The doctor diagnosed me with keratoectasia... The ectasia was progressing fast. In the same month, i received intacs in both eyes. I also received ck - conductive kerotoplasty - in my right eye and c3r - corneal collagen crosslinking with riboflavin - in both eyes... This has effected me greatly. I'm a firefighter and need my vision to work. The nasty part of the disease is that it caused me the inability to function with soft contacts and glasses... I'm very happy to see that the fda is getting involved with the requirements for lasik. Lasik is destroying lives right now. Doctors' careless attitudes are also destroying lives with the use of lasik. I would guess that in several years lasik will be a thing of the past and nobody will be performing it any longer. Patient with ectasia describes FDA approval of LASIK as "reckless"
In 2001, i had lasik, first on one eye and then on the other eye one week later, at a [redacted] clinic. I have struggled with dry eye ever since, ranging from mildly to severely annoying... I observed my first floaters--signs of a posterior vitreous detachment--within weeks of the lasik surgery - reported september 2001... Finally, in 2007, i was diagnosed with post-lasik ectasia, as my corneal topographies showed the trademark sign of inferior steepening, which accounted for my increasing cylinder and increasing symptoms of double/multiple vision... The reality of course, is that nobody is a good candidate to have their corneal strength weakened by a third by a microkeratome, for no medically indicated purpose. However, this butchery remains approved by your agency... It is unclear why lasik remains approved today despite the mounting evidence that surface ablation is much safer biomechanically. So i will have to leave this country, and visit europ instead, to have a chance to improve my vision and likely also do corneal collagen crosslinking, which was kept a well-hidden secret from us patients -frequently along with their ectasia/keratoconus condition itself, as doctors frequently don't diagnose what they can't effectively treat- for many years, by your agency... So, do consider that your agency's behavior has not only been reckless, but counterproductive. I hope you're ashamed. From the article: "Christine Sindt, an optometrist and associate professor of clinical ophthalmology at the University of Iowa in Iowa City, Iowa, has encountered the psychological effects that patients experience when they have trouble seeing. "Depression is a problem for any patient with a chronic vision problem," she said. But in the case of post-lasik patients, she said, the depression is compounded by remorse. "It's not just that they lose vision," she said. "They paid somebody [who] took their vision away." Sindt specializes in treating ectasia, a bulging of the eye that is considered the most severe and rarest LASIK complication. She sees a few dozen patients with ectasia; all of them show signs of depression, she said." LASIK dissects the corneal stroma below Bowman's membrane. Doctors have discovered that the anterior stroma closer to Bowman's membrane is stronger than the deeper layers of the cornea (see article below). This could cause significant problems in the years after LASIK surgery. The specific architecture of the anterior stroma accounts for maintenance of corneal curvature. Br J Ophthalmol. 2001 Apr;85(4):437-43. Müller LJ, Pels E, Vrensen GF. AIM: To analyse the human corneal stroma in extreme hydration to discover if its structure is responsible for corneal stability. 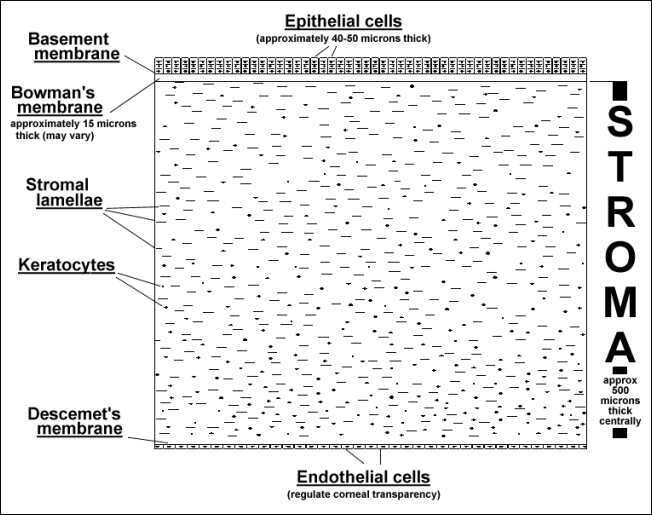 METHODS: Corneas in several hydration states were used: postmortem control corneas (PM; n=3), corneas left for 1 day in phosphate buffered saline (PBS; n=4), and corneas left for 1 day (n=4), 2 days (n=4), 3 days (n=2), and 4 days (n=4) in deionised water. All corneas were fixed under standardised conditions and processed for light and electron microscopy. In addition, two fresh corneas from the operating theatre were studied which were processed 6 months after storage in sodium cacodylate buffer. RESULTS: After 1 day in deionised water maximal stromal swelling was reached which did not change up to 4 days. The stroma of deionised water corneas (1400 microm) was much thicker than that of PBS corneas (650 microm) and PM corneas (450 microm). Deionised water treatment led to disappearance of all keratocytes leaving only remnants of nuclei and large interlamellar spaces. In these specimens the distance between the collagen fibres had increased significantly, but the diameter of the collagen fibres did not seem to be affected. A remarkable observation was that the most anterior part of the stroma (100-120 microm) in all deionised water specimens and those stored for 6 months in buffer was not swollen, indicating that the tightly interwoven anterior lamellae are resistant to extreme non-physiological hydration states. CONCLUSIONS: The rigidity of the most anterior part of the corneal stroma in extreme hydration states points to an important role in maintenance of corneal curvature. Since a large part of this rigid anterior part of the stroma is either removed (PRK) or intersected (LASIK), it is possible that in the long run patients who underwent refractive surgery may be confronted with optical problems. Corneal ectasia after myopic laser in situ keratomileusis: a long-term study. Spadea L, Cantera E, Cortes M, Conocchia NE, Stewart CW. Clin Ophthalmol. 2012;6:1801-1813. Epub 2012 Nov 2. BACKGROUND: The purpose of this study was to evaluate the long-term postoperative incidence of and key factors in the genesis of corneal ectasia after myopic laser-assisted in situ keratomileusis (LASIK) in a large number of cases. METHODS: A retrospective review of one surgeon's myopic LASIK database was performed. Patients were stratified into two groups based on date of surgery, ie, group 1 (1313 eyes) from 1999 to 2001 and group 2 (2714 eyes) from 2001 to 2003. Visual acuity, refraction, pachymetry, and corneal topography data were available for each patient from examinations performed both before and after the refractive procedures. RESULTS: Of the 4027 surgically treated eyes, 23 (0.57%) developed keratectasia during the follow-up period, which was a minimum seven years; nine eyes (0.69%) were from group 1 and 14 eyes (0.51%) were from group 2. The onset of corneal ectasia was at 2.57 ± 1.04 (range 1-4) years and 2.64 ± 1.29 (range 0.5-5) years, respectively, for groups 1 and 2. The most important preoperative risk factors using the Randleman Ectasia Risk Score System were manifest refractive spherical error in group 1 and a thin residual stromal bed in group 2. Each of the cases that developed corneal ectasia had risk factors that were identified. CONCLUSION: Ectasia was an uncommon outcome after an otherwise uncomplicated laser in situ keratomileusis procedure. 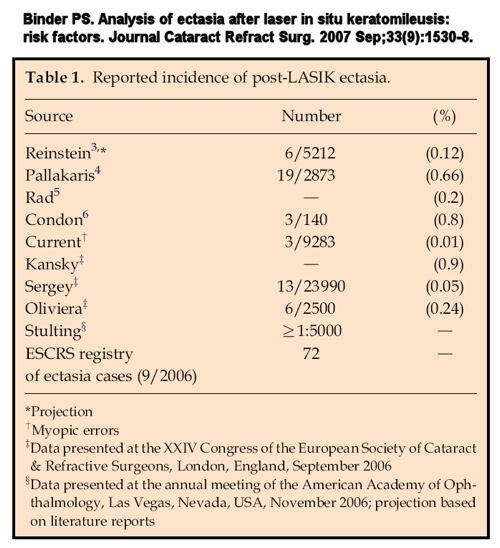 The variables present in eyes developing postoperative LASIK ectasia can be better understood using the Randleman Ectasia Risk Score System. Post-LASIK Keratectasia Triggered by Eye Rubbing and Treated With Topography-Guided Ablation and Collagen Cross-Linking-A Case Report. Padmanabhan P, Aiswaryah R, Priya VA.
PURPOSE: To report a case of unilateral post-laser-assisted in situ keratomileusis (LASIK) keratectasia in a 35-year-old woman who had no known predisposing risk factors but who rubbed her affected eye frequently and vigorously in response to allergic conjunctivitis. METHODS: Case report with relevant literature review. RESULTS: A 35-year-old woman, with a cumulative risk scale score of 0 (according to the Randleman criteria), who underwent bilateral LASIK developed unilateral post-LASIK keratectasia 32 months later. She presented with a history of vigorous eye rubbing of the affected eye since about a year after allergic conjunctivitis. The fellow eye, which was not rubbed, remained normal. She complained of glare, halos, and ghost images in her affected eye. She underwent transepithelial topography-guided customized ablation with simultaneous UV-A corneal collagen cross-linking, after which she improved symptomatically and topographically. CONCLUSIONS: Eye rubbing could contribute to the development of keratectasia, even in an eye that has no subclinical features of the disease. When detected early, a simultaneous combined topography-guided customized ablation treatment and collagen cross-linking is effective in improving the irregular corneal contour and restoring biomechanical stability. Winkler M, Chai D, Kriling S, Nien CJ, Brown DJ, Jester B, Juhasz T, Jester JV. Nonlinear optical macroscopic assessment of 3-D corneal collagen organization and axial biomechanics. Invest Ophthalmol Vis Sci. 2011 Nov 11;52(12):8818-27. Keratectasia following LASIK in a patient with uncomplicated PRK in the fellow eye. J Cataract Refract Surg. 2011 Mar;37(3):603-7. Hodge C, Lawless M, Sutton G.
Abstract: We present a case of unilateral keratectasia in a laser refractive surgery patient. Laser in situ keratomileusis (LASIK) was performed in the first eye, but because of difficulty lifting the femtosecond-created cap in the second eye, photorefractive keratectomy was performed in that eye. Neither eye had risk factors for keratectasia; both had identical low scores on the Randleman risk factor score. Although femtosecond laser caps were created in both eyes, ectasia developed in only the LASIK eye, in which the cap was lifted. We believe this is the first case of this complication reported in the literature. It highlights our incomplete knowledge of the risk factors for keratectasia following LASIK and suggests that unlifted flaps do not undergo the same biomechanical weakening as flaps that are lifted. PURPOSE: To report corneal histopathology associated with keratectasia after laser in situ keratomileusis (LASIK) and to evaluate the thickness of the calculated residual stromal bed in two cases and those in the literature. DESIGN: Interventional case reports. METHODS: Three eyes of two patients developed keratectasia after LASIK. Corneal specimens after penetrating keratoplasty in one eye of each patient were studied histopathologically, and the residual stromal bed was directly measured. For comparison, residual stromal bed thicknesses were calculated from published cases of keratectasia. RESULTS: Two eyes of a 26-year-old woman and one eye of a 22-year-old woman developed keratectasia after LASIK. Calculated residual stromal bed thicknesses were 210, 213, and 261 microm. Histologic sections revealed focal scarring in the flap plane. The cornea specimens measured 75 and 118 microm thinner than calculated values immediately after LASIK. Transmission electron microscopy of one case revealed an average lamellar thickness of 0.94 microm. In 28 (49%) of 57 previous cases of keratectasia, the calculated residual stromal bed thicknesses were greater than 250 microm. CONCLUSIONS: Both the flap and the stromal bed of the cornea may thin after LASIK. A residual stromal bed thickness of 250 microm does not preclude the development of keratectasia after LASIK. Interferometric technique to measure biomechanical changes in the cornea induced by refractive surgery. J Cataract Refract Surg. 2005 Jan;31(1):175-84. Jaycock PD, Lobo L, Ibrahim J, Tyrer J, Marshall J. Given that the corneal stroma consists of lamellae thought to run from limbus to limbus across the corneal arc and that the lamellae consist of organized collagen fibers, loss of lamellar integrity may compromise corneal strength. A significant number of collagen fibers are severed in LASIK compared with a corresponding PRK procedure.4 Hence, the microkeratome flap in LASIK uncouples a significant proportion of the corneal biomechanics, which may affect refractive stability. With the significant reduction in the biomechanical integrity of the cornea, at worst LASIK has the risk for inducing iatrogenic keratectasia5, 6, 7, 8, 9, 10, 11 and at best, a propensity for long-term instability. Although the incidence of iatrogenic keratectasia appears low at present, LASIK has only been used in clinical practice in recent years and the long-term results are unknown. Despite this potentially serious complication, the popularity of LASIK is growing at a fast pace and more than 5.5 million excimer laser refractive procedures have been performed. Although iatrogenic keratectasia is most common in eyes in which thin beds have been left, cases have been observed when the corneal bed after surgery is thicker than 250 μm, which is regarded by some as an arbitrary safe minimum corneal thickness. When the microkeratome flap was replaced to cover the stromal bed, the out-of-plane surface movement was of the same order as the movement when the flap was removed, exposing the stromal bed. This indicates that although tissue bulk had been restored, the biomechanical properties remained altered relative to preoperatively because of uncoupling of the collagen fibril array. The study showed that measurable changes occur in corneal displacement subsequent to microkeratome incisions and such changes are hardly influenced by relocation of the flap. Furthermore, such variations were measured with pressure changes of 0.15 mm Hg (20 Pa), corresponding to a 1% change in IOP. The apparent small difference in out-of-plane displacement (0.3 μm) between the operated and unoperated eyes should be considered in relation to the precision of the measuring technique; that is, 0.01 μm. Thus, these are real effects and should be of concern to the ophthalmic community. Our results can be summarized as showing (1) a measurable change in out-of-plane forward movement or “bulging” of the cornea with increasing pressure and (2) a region of disharmony coincident with the plane of the microkeratome transsection. In contrast, biomechanical considerations would predict instability with LASIK. This concept is derived from the finding that no repair transgresses the plane of the microkeratome incision and integrity in this region is established by deposition of ground substances such as fibronectin and tenascin. 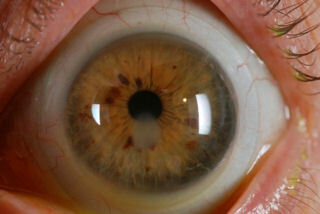 It is further supported by histological observation of corneas that have keratoplasty after LASIK. In such samples, although the bed remains intact, the collagen fibers within the flap show disorganization and atrophy. This finding supports the concept of reduced strain in the flap because of uncoupling from the stromal bed and atrophy of the fibers tectonically isolated from biomechanical movements engendered by processes such as accommodation. It is unfortunate that few studies have been published on the long-term effects of LASIK. The 1 study that reports 6-year data gives graphic information that is contrary to written claims in that there is a trend toward regression with time. If this trend becomes significant, it further emphasizes the need for a better understanding of the biomechanics of the cornea.